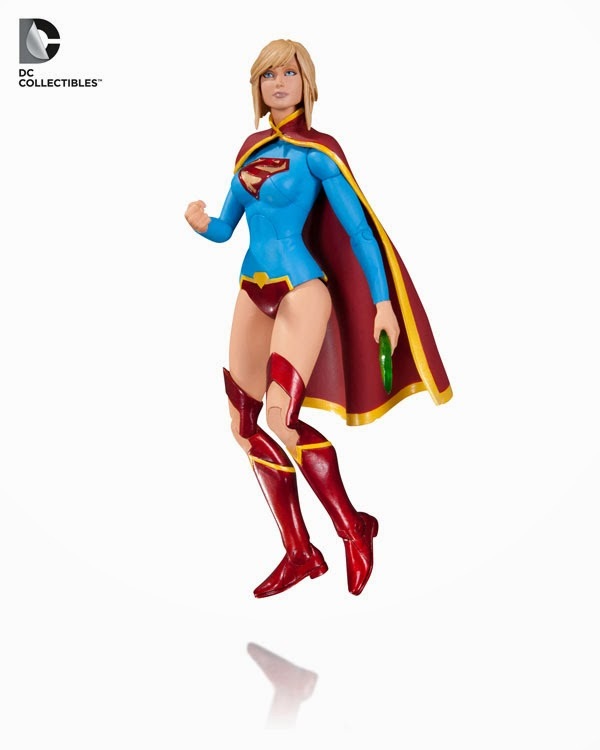 And one of the offerings is New 52 Supergirl action figure! This is the only shot I have seen released but it does look like a beauty. There are plenty of details to notice. Looks like there is articulation at the shoulder and ankle as well as the usual elbows and knees. The fussy indented lower seam of the costume, one of the things that really bothers me about this costume, is missing. That is one hem. Now I hope the K-crystal is removable. I suppose that is included because she used it to try and murder H'El . One thing that really stands out for me is the hair which looks exactly like Mahmud Asrar's rendition of it in the book. As these are preview pics, there isn't price point or release date information right now. I suppose that will be coming soon. But I am definitely in! 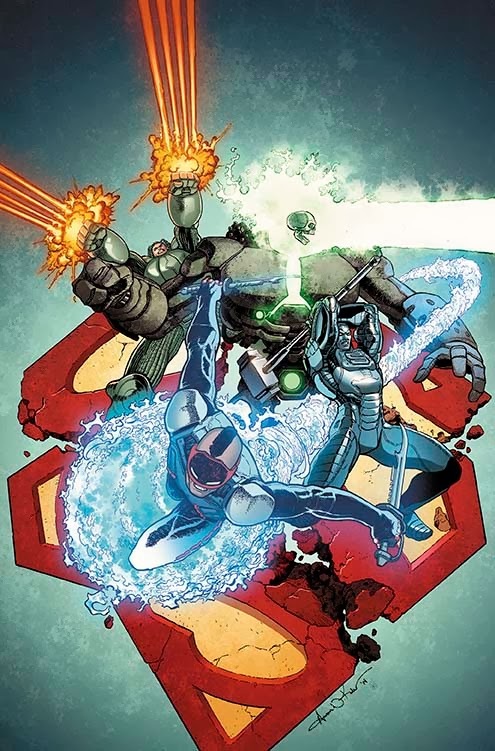 Given her return to the DCU in Forever Evil: ARGUS, I am in the middle of my look back at the Supergirl villain Psi. Today, that means reviewing Daring New Adventures of Supergirl #3, the last part of Psi's biggest splash in the DCU. Psi, the mutant psionic powerhouse, has given Supergirl a run for her money on the first two issues of Daring New but it is clear that she is conflicted. Psi might have been raised with with a warped view of life but she seems to know right from wrong. 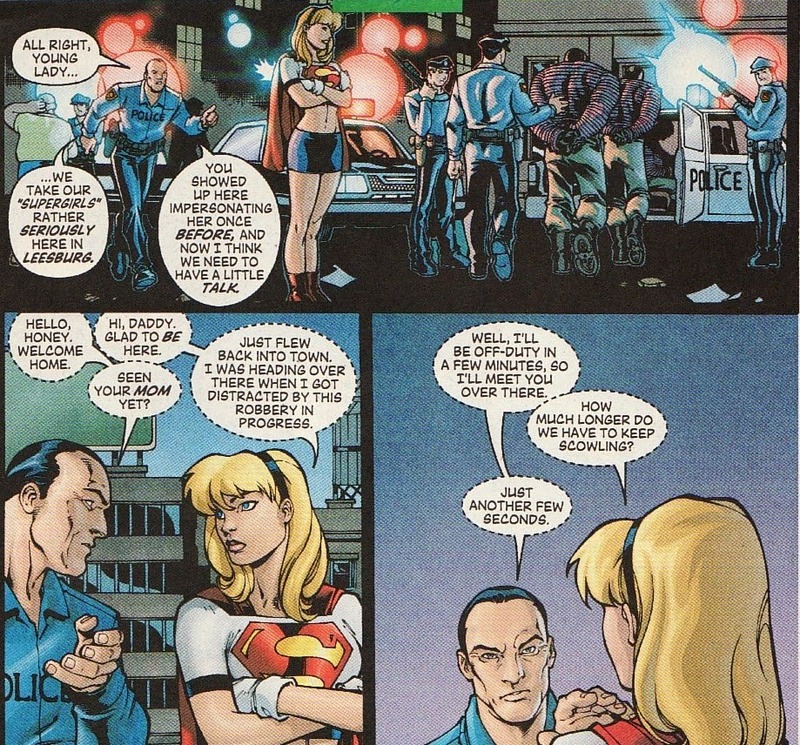 In DNAoS #2, Supergirl basically talked Psi out of laying waste to Chicago. But Psi is also a bit unhinged and seems a bit naive. Last issue ended with her blasting her deluded mentor Mr. Pendergast with her power, inadvertently changing him into the monster Decay. 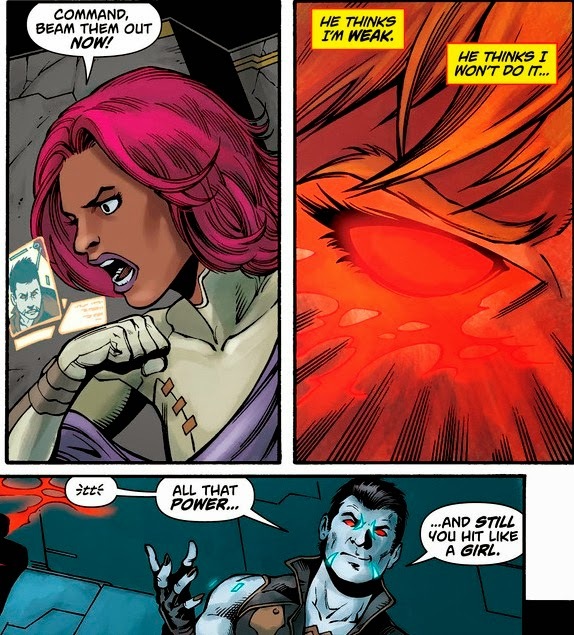 Powerful, psionic, and just a little unhinged ... no wonder Psi is a great character and rogue for Supergirl. The art for the book was done by the standard team of Carmine Infantino and Bob Oksner with the usual flair. But for me, the most interesting thing is the cover done by Keith Giffen and Klaus Janson!! There is a sort of early horror comic cover feel to this with the monstrous Decay looming in front of a full moon. I love that he is standing on the word Decay, a bit of Eisner or Steranko. And lastly I love that the word Decay is decaying more under his feet, his own touch eroding the word. Supergirl is almost an afterthought but I love her springing into action. I have praised this title in the past for portraying a happy, confident Supergirl ... comfortable in her own skin and ready to be the defender of Chicago. 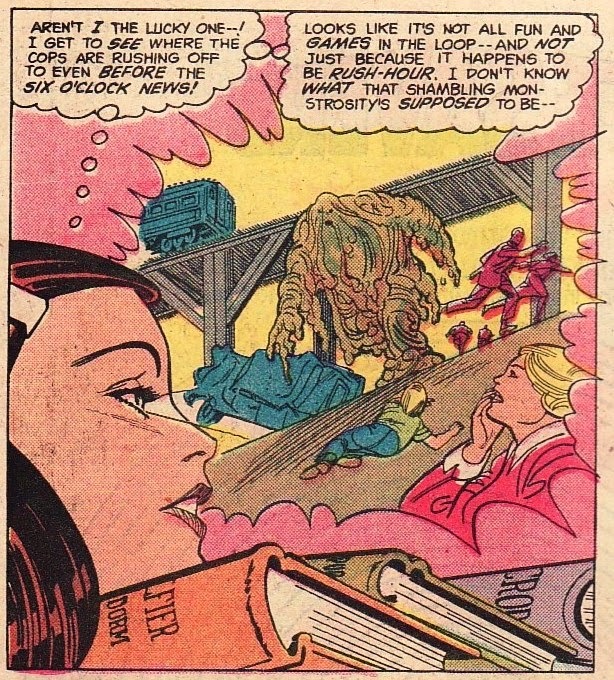 And I love that Paul Kupperberg gave Linda's life a big chunk of time in this book as well. She had friends, her schoolwork, and a romantic life as well. And we see more of her life at the University. Linda is majoring in Psychology and is meeting her advisor, Dr. Barry Metzner. Metzner turns out to be something of a disorganized mess, his office a maze of tall stacks of loose papers. But something about that is endearing to Linda. She even calls him cute! 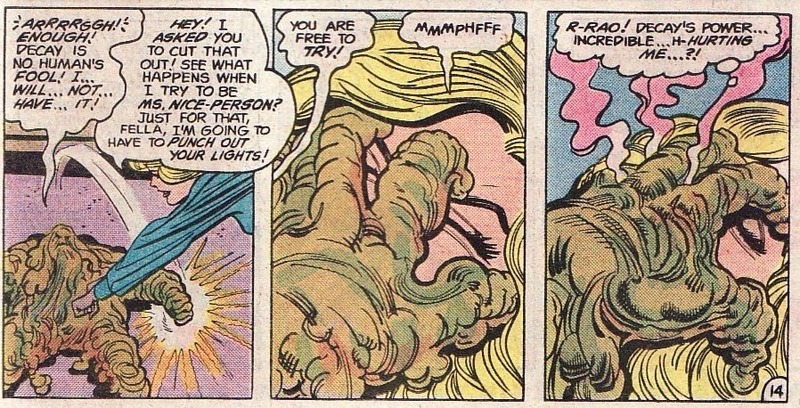 I love that second panel, her finger to her mouth ... a classic Supergirl personality quirk which has carried through from Jim Mooney's Action stories to this day. In the end Metzner offers Linda a job to be his assistant/secretary, a job she accepts. Metzner continues to putter through the title, eventually becoming a villain! As for Mr. Pendergast, he has completely embraced his new life as Decay! It is a little weird that he loathed the idea of Decay only to do a complete 180. It is always interesting to look back at these issues which I read in my youth. I can remember thinking this scene in which Decay basically erodes or digests a homeless alcoholic was absolutely terrifying. In the scene, the man screams until he is nothing but a bunch of bones and rot. Seeing that pile of remains was horrific and pretty graphic for the time. It is somehow sad that this scene would actually be considered understated in this comic world where people get disemboweled, beheaded, etc. He lumbers through the town, wilting and dissolving everything in his path. Despite hanging out with her housemate Joan and being 'weighed down' with all her class books, Linda knows what she needs to do. Her super-vision spies Decay and zips on her way. Again, I have to applaud the great exposure of Linda's life and the interaction between both sides of her persona. 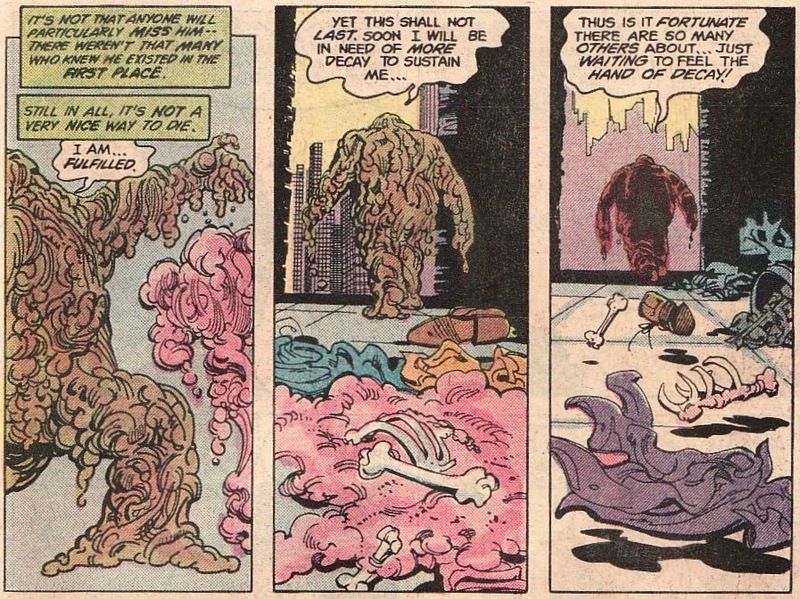 And Decay is pretty vile appearing, like a diarrheal form of Clayface. Yuck! Remember, this is a Supergirl who is sure of herself, ready to jump into the fray to do what's right. She also is quick with a quip, another sign she feels pretty confident in her capabilities. So with little delay, she flies up to Decay and takes the fight to him. She has had it with megalomaniacs hoping to rule the world. And this panel progression is nice as you fill in the action in your mind, Supergirl swooping down in the first panel and making a hairpin turn to fly into Decay in the second. But this is a Psi-sighting post ... isn't it? Since Psi's power created Decay, she is linked to him. As I said, at times seems innocent, like a sheltered girl not exposed to the horrors of the world, or even the trials of every day life. Last issue, she seemed to feel pain from the destruction she was causing ... almost like an empath. And here she feels mental agony from the devastation that Decay is causing. She is the cause of it. And she needs to end it. I have to admit I also liked this little sequence, showing just how powerful Psi is. She doesn't fly through the window, shattering it. Instead she 'unmakes it', flies through, and then remakes it in her wake. Interesting. 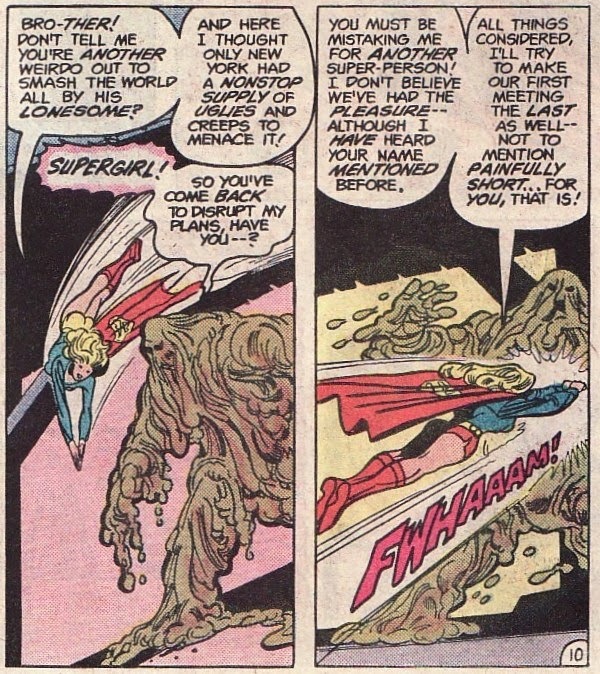 The Decay fight with Supergirl is actually a decent brawl with Supergirl bashing him with cars, concrete walls, construction beams, and her fists. But everything just disintegrates in his grasp. And here, his touch is sizzling even to Supergirl! Psi finally shows up and decides to end things. If she created Decay, she certainly can destroy him, even kill him. But that doesn't happen. Instead of outright killing Pendergast, she simply strips him of his Decay form, returning him to normal. And, like last issue, Psi is gone before the dust settles. So is Psi the hero of the piece, saving the day? Or is she a villain? I think she is a little bit of both. Psi seems like there is a good core somewhere in her. But she is clearly an addled young woman, prone to outbursts with her fantastic powers. It isn't a temper ... it is more like a hair trigger. I don't think Psi knows who she is herself. And that makes her scary. As for Supergirl, she is almost a nonfactor in her own book. While it is great that she flies right into combat, she isn't exactly effective. Direct physical attacks were found to be useless early on. Why not try heat vision, freeze breath, or some other attack? Psi truly disappeared after this issue, not being seen again in the DCU for 5 years. That means there will be another Psi-sighting in the near future. 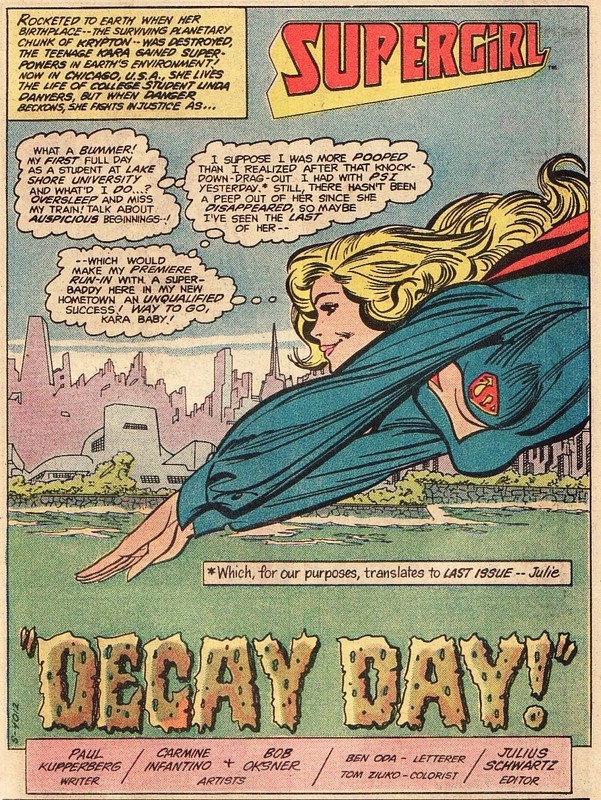 As for me, the Supergirl/Decay throwdown was pretty standard superhero fare. What I liked best were the Linda scenes, a great part of this series. Review: Supergirl #75 - Supergirl Meets Supergirl?? I try to keep things streamlined on this blog so I apologize for the simultaneous threads I have going. 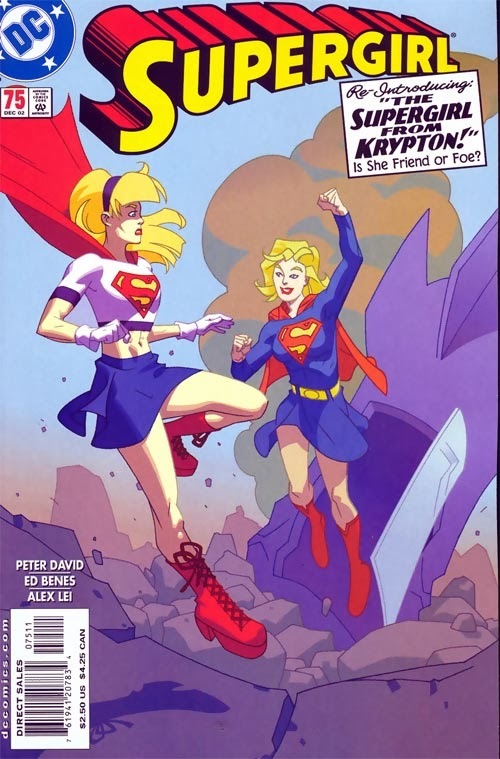 I am working my way through two back issue themes these days - Psi-sightings and times when Supergirl met Supergirl. And I seem to have picked an alternating pattern which means I am back for a Supergirl/Supergirl meeting. 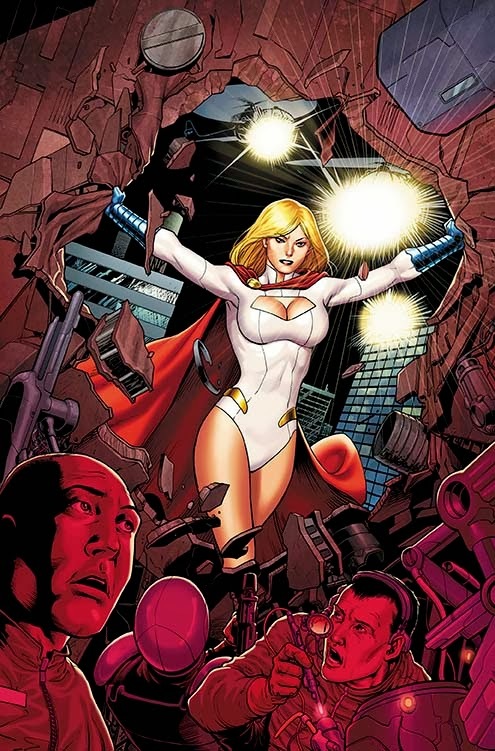 Supergirl #75 was the first part of the beloved 'Many Happy Returns' story arc by Peter David and Ed Benes which ran through the last issue of the series, Supergirl #80. Now there is a lot to cover about this issue before we even get to the story inside. Peter David is obviously a Supergirl fan and had injected a lot of Supergirl history into this series despite the main character not being Kara Zor-El. This was Matrix merged with Linda Danvers, an Earth-born Angel, a more mystical character. The series was just wonderful, a look at religion in a world of super-heroes; a look at temptation, sin, and redemption; and a look at forgiveness. It is a testament to how great this series is that most Supergirl fans love this series, despite this being as far away from a Kryptonian Maid of Might as you can get. David had basically put together 2 very long over-reaching story arcs. The first, covering the first 50 issues, reviews Matrix merging with the flawed Linda, accepting her role as an Angel of Judgment, being tempted to use her power in anger, and then forgiving herself and others. It is fantastic. The second arc, covering the next 2 years, has a depowered Linda looking to remerge with the angelic aspect of her persona which was stripped from her in the climax of the first arc. This arc has Linda comparing herself unfavorably to other 'good' people until she finally sacrifices herself to save the world again. With DC getting a bit squirrely about the 'complicated' origin of a protoplasm from a pocket universe merging with an angry teenage girl and become something holy, David was nudged into bringing Supergirl back to her more Matrix-y powers. Gone were flame wings and judgment stares. We were back to psi-blasts and strength and flight. But ... and this is key ... we suddenly had a Linda who was happy. A Linda that was glad to be Supergirl and had put her inferiority complex, her fears, and her anger behind her. We finally got a Supergirl who was ready to be a hero. It surely couldn't last. Ed Benes was a newcomer when he started on Supergirl here and this is how I will remember his art, cleanly inked by Alex Lei. There is a healthy slab of cheesecake in these issues but the art is beautiful. Benes went on to greater acclaim soon, going over to Birds of Prey with Gail Simone. The last issue was the ending of a long arc where Linda saves the Angel of Judgment. She then accepts that the angelic being would better be served merging with a cursed being called Twilight. That means she is back to being 'just Matrix' but she is happy to be defending Leesburg again. As I said though, it is that happiness is key. The prior 74 issues had a lot of emotional turmoil and pain. 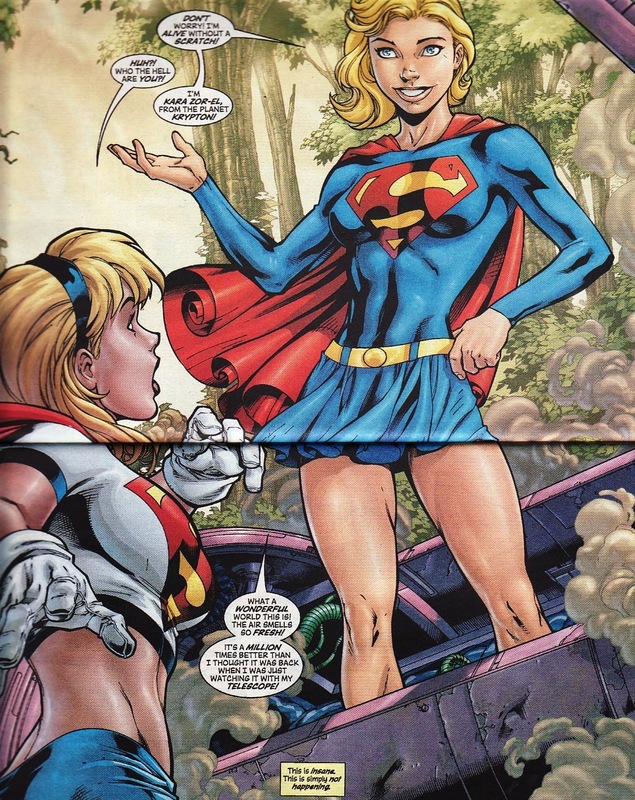 We suddenly have a confident Supergirl, as close to the Paul Kupperberg Daring New Supergirl as I have seen. In the opening scene, Supergirl stops a bunch of tech-powered robbers. But she does it with this feint. This is cute and humorous and shows how this Linda is going to have some fun with her 'job'. And not only is she happy with her life as Supergirl, she has a new and happier relationship with her parents. Linda was a rebellious teen. When her parents discovered she had merged with Supergirl, it nearly broke them. While her father accepted it sooner, her mother abandoned her religion and hit the bottle. Now those wounds have healed. There is love and acceptance here. I like this banter where Fred Danvers has to pretend to dislike Supergirl while he is proud of his daughter. David doesn't leave anything to chance. He tells the readers just how Linda is feeling. "I can't remember the last time being Supergirl was nothing but pure fun for me. And I am Supergirl." This title is an interesting character study in seeing just how much psychological pain a person can take. Linda is really hammered on throughout the series. And so you knew that this happiness couldn't last. And a classic purple rocket heading to Earth was a harbinger. But before life turns upside-down, we see more of how wonderful Linda's life is for just these few moments. Linda's mother has not only turned her life around, given up alcohol and grabbed onto her love of her family. And ... she's pregnant! Supergirl will be a big sister. That smiling face of Linda as she grabs her mother in the lower panel is wonderful. It isn't a common site in this book. That rocket crashes near Leesburg and Supergirl goes to investigate. And there she sees .... Super-girl (note the hyphen). It is a nice homage to the classic Action Comics #252 intro. Here is a young, fresh, innocent, peppy, and incredibly powerful (in a pre-Crisis sort of way) Kara Zor-El who is thrilled to be on Earth. She even discusses how she lived on Argo City, watched Superman through a 'super-telescope' and is glad to finally be here as Super-Girl. How can Linda Supergirl be happy as finally being 'Supergirl' if now this true Super-Girl is around? And Kara Zor-El? She hadn't existed in the DCU since 1986. And there are a ton of references that harken back to the Silver Age origins? How did is this happening? Well, the leader of the tech-robbers from the beginning of the issue - Johnny Reb - shows up trying to show Supergirl whose the boss of Leesburg. But Super-Girl is there and being a Silver Age Kryptonian is incredibly powerful. And in about 2 seconds she takes out Johnny with heat vision. I love her very sweet dialogue. "That'll teach you to pick a fight for no reasons!" How wonderfully sugary! 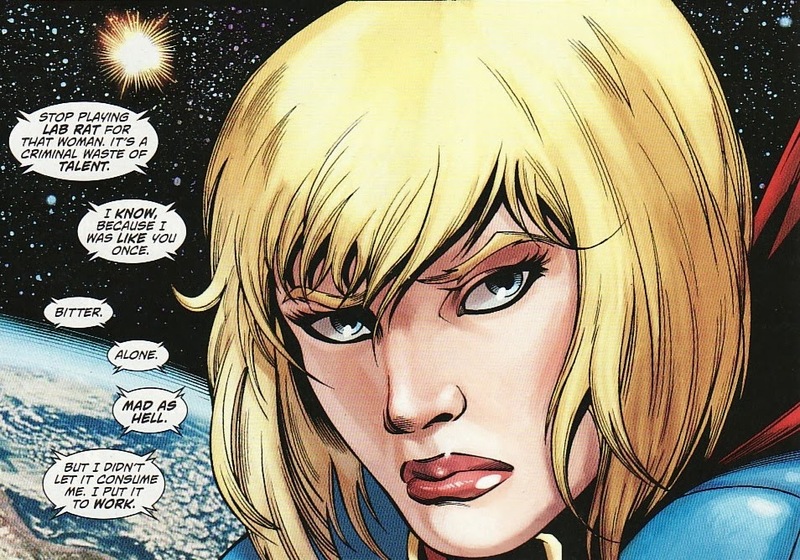 Remember though, this Linda Supergirl has been tricked, stomped on, and manipulated throughout this series. A Kryptonian Supergirl? And just at the point that Linda is happy with her life? It has to be a trick. So she grabs Kara and asks the younger version who sent her? Of course Linda can't be happy. That isn't the point of this book, really. That inferiority complex bubbles immediately to the surface. And this is the Silver Age Super-girl Linda is throttling ... a young girl so prone to tears, so quick to feel inadequate herself, so fragile in her own way. This rant prompts Kara to collapse, sobbing about the sadness in her life, how she just wants to have a home with family. This is the sweetest most innocent young girl, a child of the late 50's, willing to acquiesce to whatever Superman wants her to do. Super-Girl flies off to find Superman. This is just a taste of this bittersweet story. This truly is the pre-Crisis Super-girl. When it becomes clear that she needs to return to her world so she can die at the hands of the Anti-Monitor, Linda takes her place. It is another sacrifice for this wonderful hero. A Silver Age Supergirl is in the grim current DCU. The more modern Linda Supergirl is put into a 'Pleasantville' world of the Silver Age DCU. But things veer to the tragic in the end, breaking Linda down even further in the end. This is just a fantastic arc. I will only review the first chapter here in this thread but I love this story so much. Both Supergirls shine here as David looks at all things Linda and Kara, contrasting them and showing how heroic they are. Linda's story has a sad ending but unbelievably perfect for the tone of this entire series. And Kara? She ends up back in the Silver Age DCU, working her way to Crisis #7. If you are a Supergirl fan of any iteration or all iterations, I cannot recommend this arc more highly. The issues are probably a couple of bucks in the back issue boxes. It was collected in a trade with a wonderful foreword by David. It is a solid story - joyous and sad, funny and somber - with just eye-popping spectacular art. If you haven't read it, you need to. And so ends my review of the opening chapter of my favorite time Supergirl met Supergirl. There is one more comic to touch upon in this thread ... my least favorite. And here are the solicits that grabbed me. 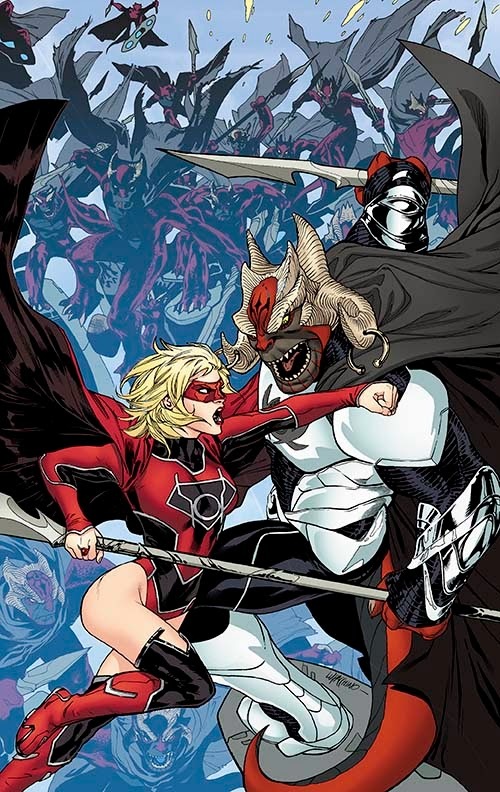 So I was hoping that this would be "Red Daughter Part 3 of 3" but it looks like this Red Lantern phase is going to last longer than I initially thought. 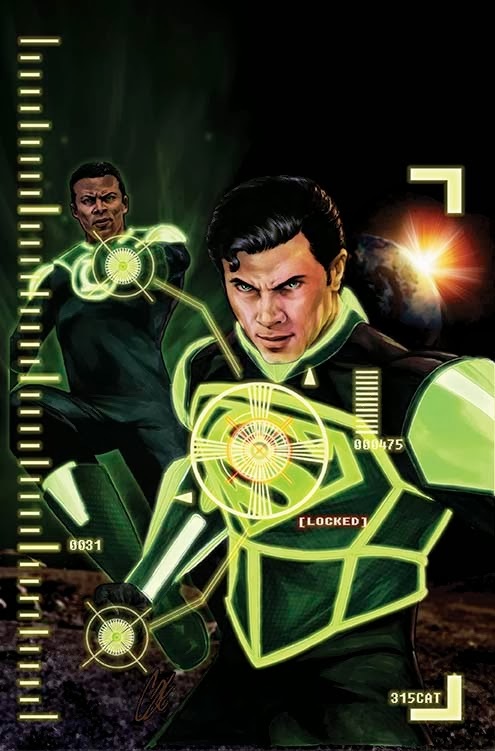 This new villain has to be World Killer 1. At least Kara isn't that! This will also be the first issue of Emanuela Lupacchino on interiors. Can't wait to see her take. 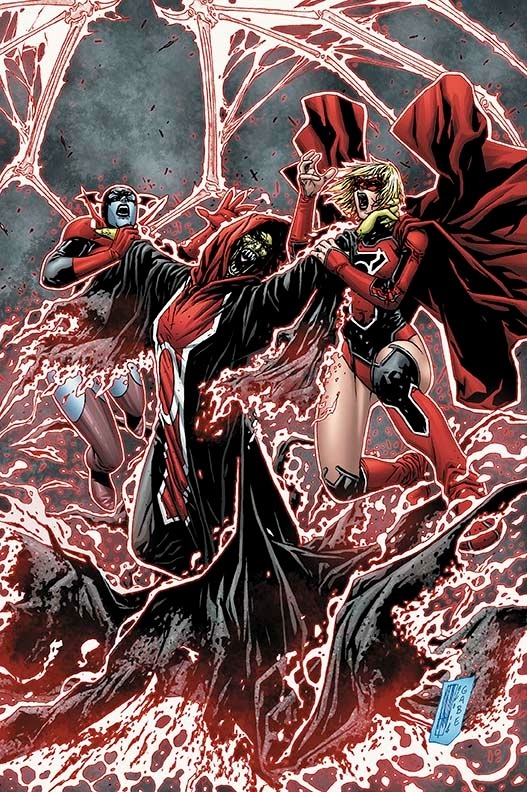 And we still have Supergirl in Red Lanterns as well. It will be interesting to see if the two titles and there representation of Kara align. I want a consistent characterization. It seems like Supergirl will fit in here, at least for the time being, giving her finally a place she belongs. Supergirl as a Red Lantern for an unknown amount of time. Not Death of Superman ... something different. This was hinted at in Pak's Doomsday issue in Villains month issue. Will Superman die again? This isn't a story I wanted to see again .. even homaged. And I don't like Soule and Lobdell having so big a part in it. And ... of course ... Superman fighting Doomsday terrifies the world. 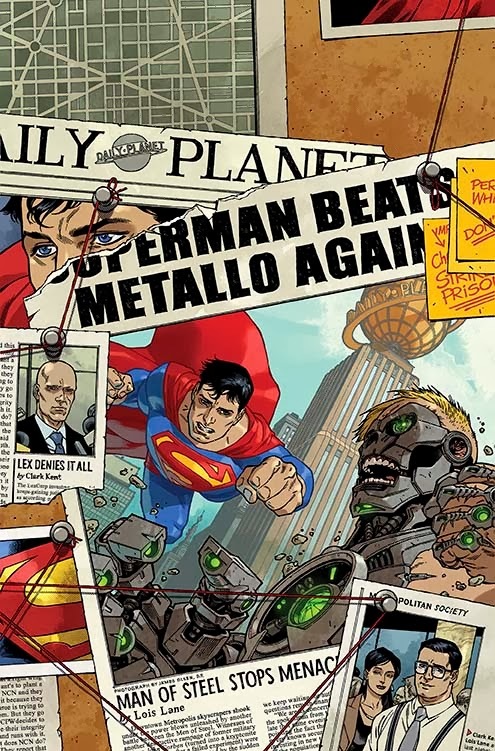 Just what we need, more stories where Superman is rejected by humanity. All that said. the Men of STEEL sounds like a neat concept. And this Atomic Skull seems much more mainstream and less like the purple headed character in the Max Landis story. That's fine with me!!! How does Superman heal after all this? I thought all this Brainiac stuff ended with the Parasite. Looks like Lobdell wants to go out with an off-putting bang. And Lois fights Superman. Why not?? Everything else has been done improperly with Superman in the New 52. 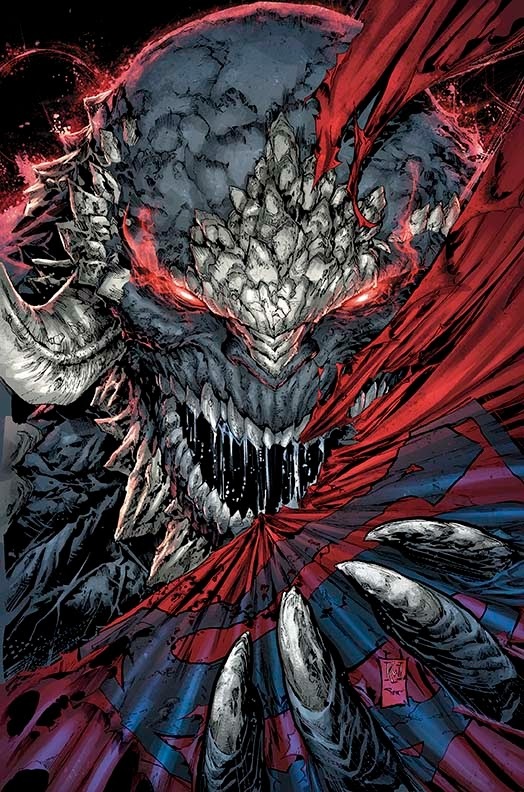 Now it seems like Superman is becoming Doomsday. It is sad. But almost eerie how much it mirrors Morrison's Super-Doom, the mass produced non-hero Superman of a bitter universe. Oh Morrison, you looked into the future again. And Wonder Woman contemplates killing Superman too! Well, if Lois is fighting him, why not Diana! 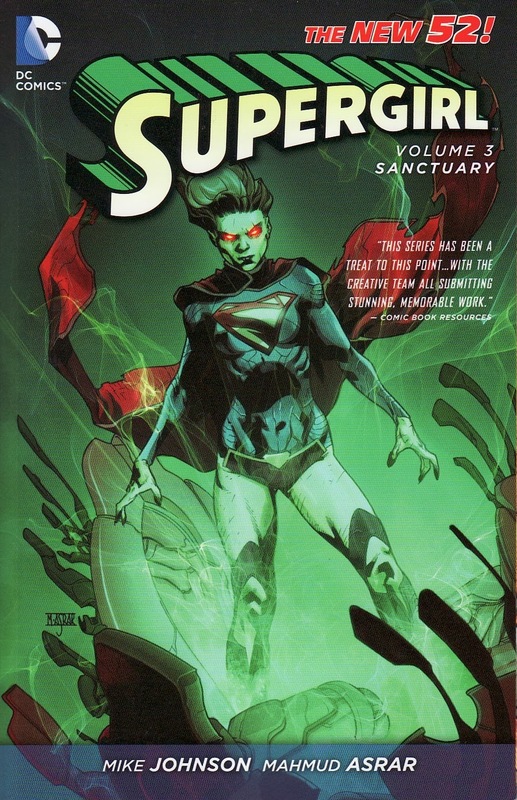 At least we Pak and Jae Lee back on this book and doing an Earth 2 story. I loved the first arc. And this cover looks sooooo beautiful. I love that Lois. I remember reading some of the JLA fights against the Unimaginable in the late Silver/early Bronze age so I am intrigued to see an updating. 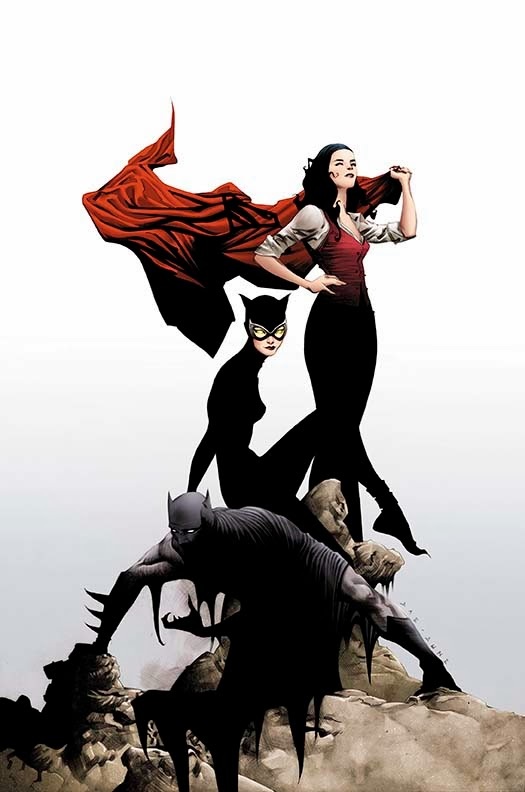 And the cover has another hero in shadow ... while Supergirl is missing. It must be Supergirl but DC is being coy about which costume she is wearing ... her classic or her Red Lantern one. John Stewart in the Smallville universe!! We really have a DC pantheon there! I don't know much about either creator but the plot sounds good. The cover is also slick, reminding me a bit of Leinil Yu. This might be the big issue we have been waiting for! 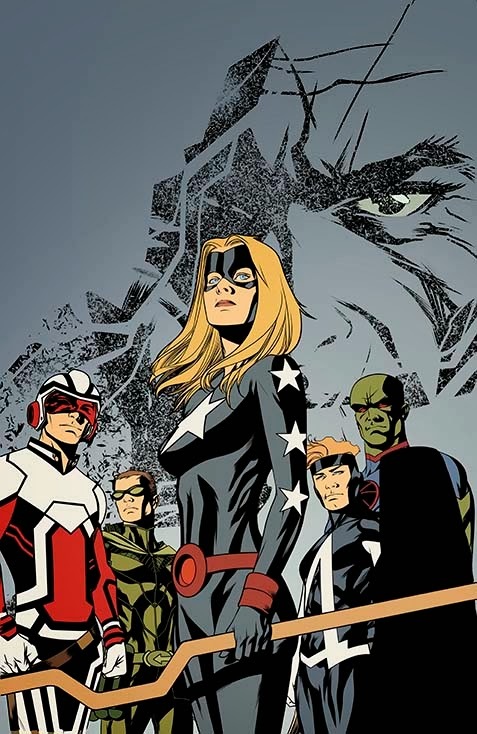 Maybe the Worlds' Finest team goes back to Earth 2. And maybe Levitz leaves the book opening up the way for a bold new direction! Love the cover. Kitson is awesome! Still hoping the Red Lantern phase is brief! I sometimes have to laugh at DC's publicity people and how at times they don't seem to have read the very books they are promoting. 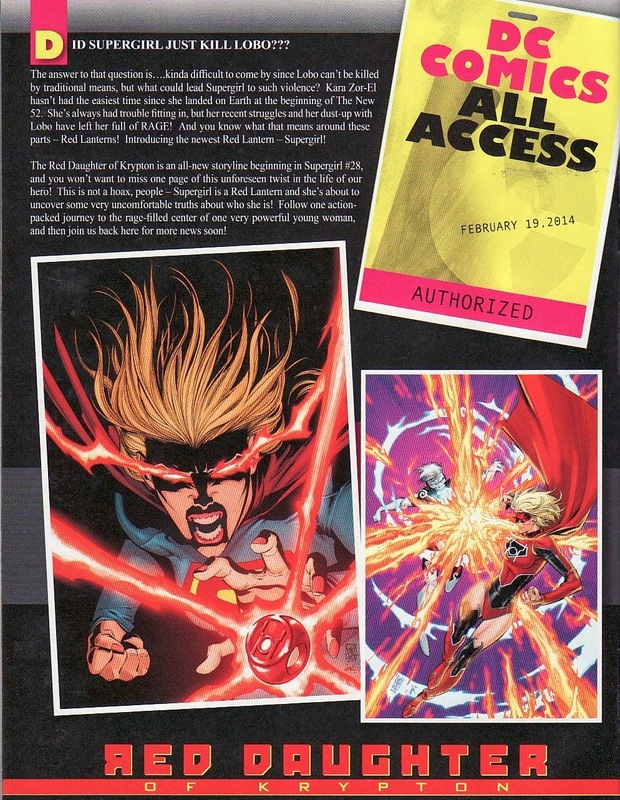 So the back page of this week's DC Comics is the print version of DC Comics All Access. And it is promoting Supergirl. That is usual a happy event for me, showing that the company is trying to bring attention to the character. 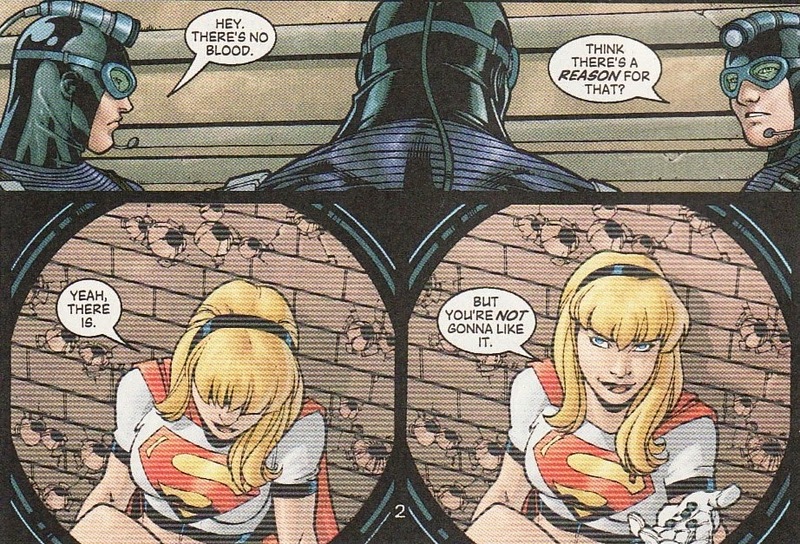 Is Supergirl a murderer?? Not exactly the best tagline for a teen hero. But let's move on. Because that didn't bother me. 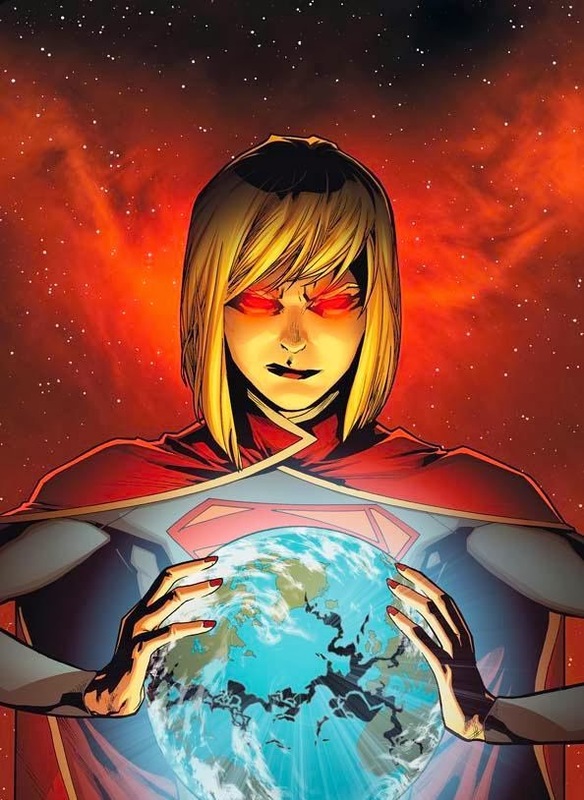 Why would anyone who has been reading this book think it would be a hoax for Supergirl to be a Red Lantern? Doesn't it seem completely consistent with the book and how DC has been marketing here? Selfishly happy that the universe is unraveling around her in Krypton Returns. She hasn't been acting like someone where it would be ludicrous for the Reds to recruit her. "This is no hoax, people - Kara accepts Earth, reconciles with Superman, and becomes a hero!" Because that is more unbelievable given the 28 issues before. So why would they write that? Because people think of Supergirl as a young optimistic hero trying to help and occasionally failing but always learning. It doesn't matter that for 2+ years she has been this bitter, angry, sad, isolated person. For many it would be a hoax for Supergirl become a Red. Because no one wants Supergirl to be a Red ... even if DC wants to shove it down our throats. I have said it before and I will repeat it. Supergirl fans don't want to see her dark. And fans of dark characters don't want to read Supergirl. That's why these takes always fail ... ALWAYS. That's why they feel like hoaxes. That's why it is wrong. I mean, the Red Lantern story is here and happening. And maybe it is appropriate because that promo piece enraged me. Because it is ignoring what DC has done to this character since the New 52, trying to make it seem like this step to become a Red Lantern is a big one, and odd, and out of character ... when really, for the most part, she has been an acolyte in waiting. I'll continue to hope that Tony Bedard means it when he says he is using this to reset things. That better not be a hoax! 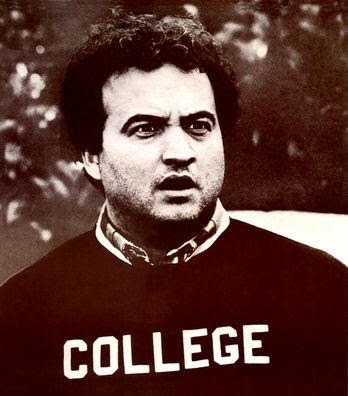 I am away this upcoming week, taking a course at local institution of higher learning. While I have a week's worth of material queued up, reviews for this week's comics will be delayed. And I most likely won't be able to reply to comments until the evening time. The latest trade collection of the current Supergirl title came out last week, collecting Supergirl #13-#20. It is something of an uneven mix. We have the battle with Tycho in Sanctuary. We have three issues of H'El on Earth. And then the crossover with Power Girl. I am assuming that DC realized that a H'El on Earth trade in and of itself would not sell. But reading three separate chapters in this trade read a bit disjointed. I will say, reading all these issues in a row, you really get the sense that Mike Johnson was trying to turn the corner with Kara, have her become more invested with Earth, and become a more sympathetic character. The Michael Alan Nelson Power Girl issues were the high point of his run (and maybe the best issues of this title). And the book is mostly done by Mahmud Asrar making me re-realize just how great his art was on this book. 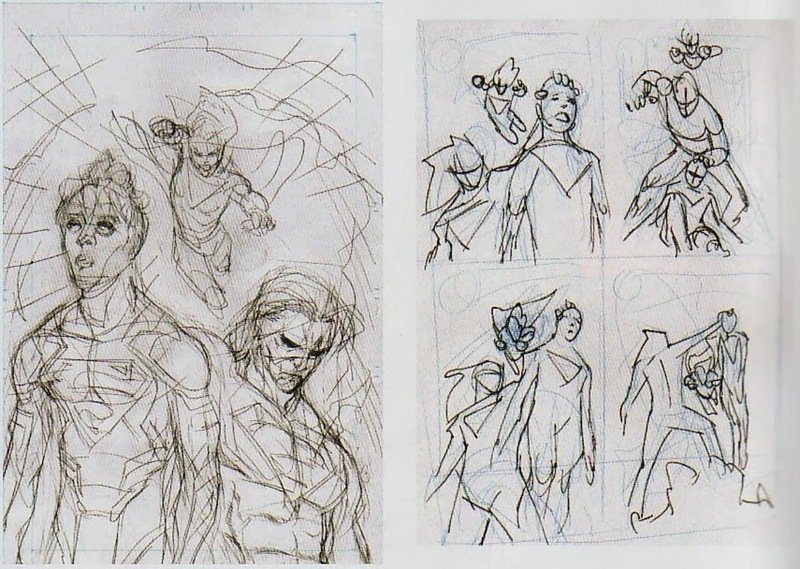 The end of the trade is a great treat for fans of the book and Asrar as we get to see some of the concept art he had for covers and inside pages. As a long time fan, I love these 'behind the scenes' peeks at production. I include just a sample. Here are the concept covers for Supergirl #14. The picture to the left is a sort of more actualized sketch of the ultimate cover. But it is the thumbnails on the right that I find fascinating. The first one is clearly the model for the final cover. But the others are so interesting. The second one, with Superboy slumped getting a beatdown is wild. 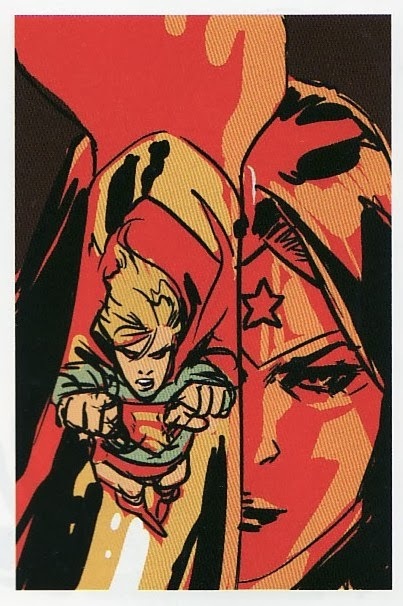 I have to assume that this was an idea for Supergirl #17, the issue of H'El on Earth where Kara and Diana squared off. The final cover is a shot of Wonder Woman bracing herself as we see her from Supergirl's POV. But I think I would have liked this one even more. That is a powerful image of Wonder Woman, calmly getting ready to parry the incoming attack of the streaking Supergirl. I wonder if the fact that Supergirl's costume would have a reverse S (as it is a reflection) would have put off DC. Still ... fantastic. But this was my favorite page. 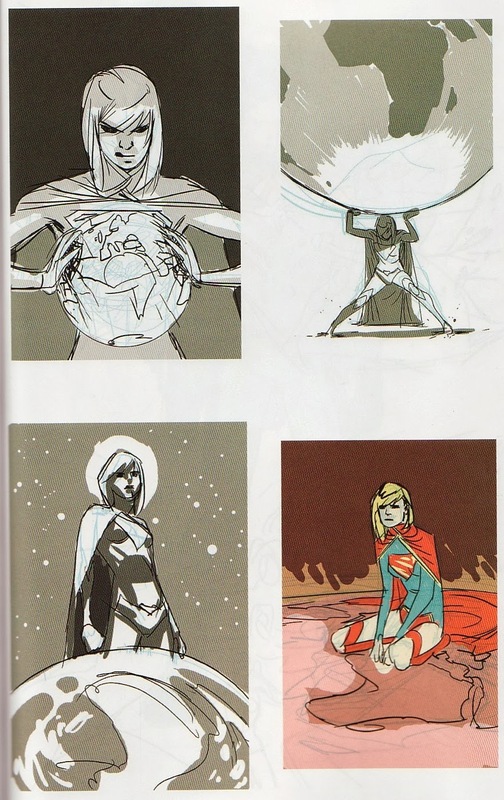 You might recall that the original cover solicited for Supergirl #18 was one of her crushing the Earth, a dark version of All Star Superman #10. I thought it was terrible and was glad to see it never used. The top left is the thumb nail of it. So I was fascinated to see these other versions of the cover. I love the one on the top right. It works so much better, Kara being weighed down by the world. She is being crushed by it, struggling with it. This makes her more sympathetic and represented the tone Mike Johnson had much more than the violent one. And the bottom right also works. The tone of the book at this point was one of grief and sadness. So this one, sitting in an exhausted and defeated pose, shows that feeling of being lost. 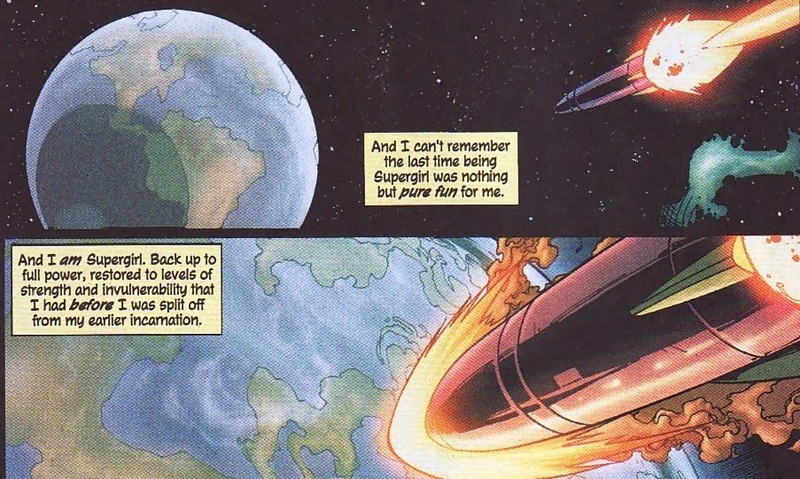 It even had the faint feeling of All-Star Superman #1. Instead of sitting on a cloud like an angel, looking happy ... she is slumped on Earth looking sad. Anyways, I am glad that DC included these. I love extras in trades I buy. 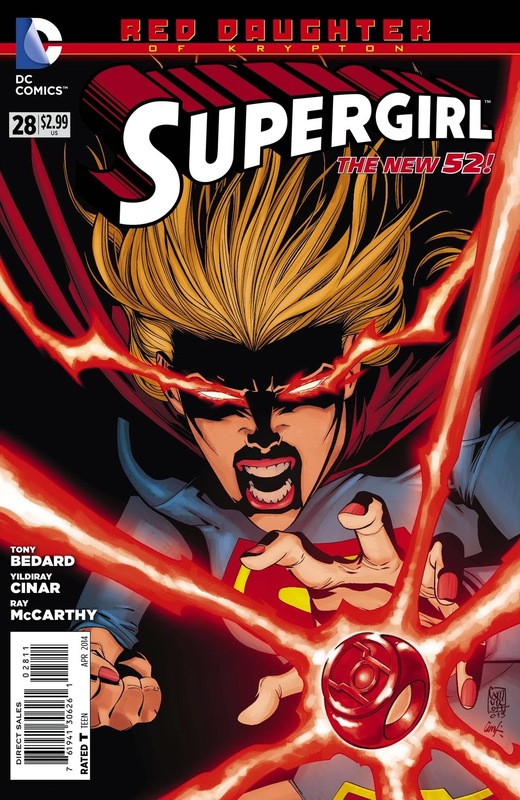 Supergirl #28 came out this week, the first part of the Red Daughter of Krypton storyline. We have been hearing about this story arc for some time now and so I am glad to finally have it arrive. Writer Tony Bedard has been talking about how this arc will be a turning point for Kara, a way for her to deal with the past and move on. So if it is a character catalyst, I suppose I am fine with it. It is time for this Supergirl to accept Earth as home and become the hero we all want her to be. For me, the part that I have been most interested in is seeing just how we get from the sullen Kara to one who accepts a Red Lantern ring. I feel that Mike Johnson and Michael Green wrote this book as a treatise on grief and not necessarily rage. 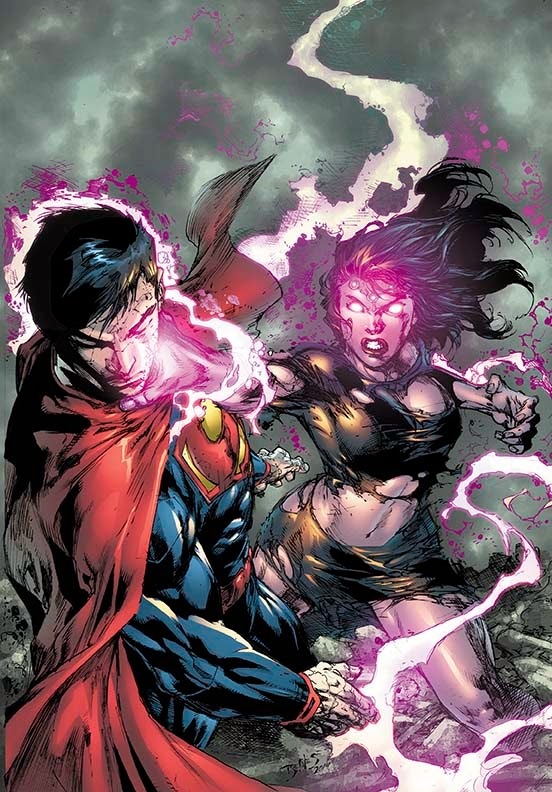 But as time has gone on, with H'El and Krypton Returns and Zor-El, things have been leaning more towards anger. Still, there have been enough glimmers of hope in this Supergirl that embracing rage seems off. In this issue, Tony Bedard does a good job stripping away the last bits of hope and comfort from Supergirl. And in an acute setting, I suppose, I shouldn't be surprised that Supergirl gives in. Still, some of her reasoning is off. I still think that a lot of this self-anger, transferred to everyone and everything. As I have said before, I am being a bit more lenient on this arc since I know it has an end, and relatively soon. But if I didn't know that, I would be pretty unhappy with this. DC could have taken Supergirl in a whole different direction in the New 52. Here as a Red Lantern is the direct result of what might be considered a flawed premise. All right, enough bemoaning the direction of Supergirl since September 2011. The art by Yildiray Cinar continues to be spectacular. He really draws a wonderful Supergirl. And we get to see the scope of his art - from sci-fi settings like The Block, urban settings like Siobhan's apartment and neighborhood, and horrific settings like Blaze's holding pen. One thing Bedard does show us this issue is just how powerful Supergirl is when fully charged. 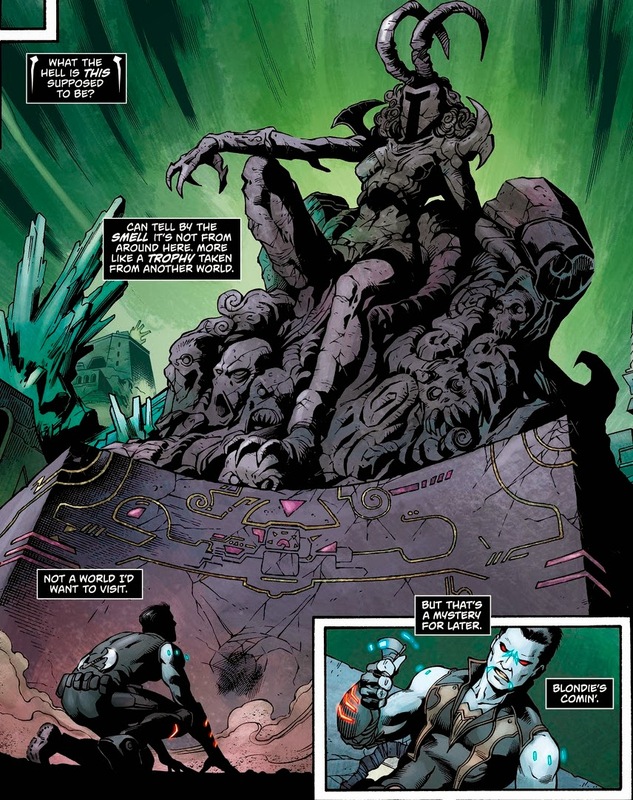 She basically puts a beatdown onto Lobo this whole issue. 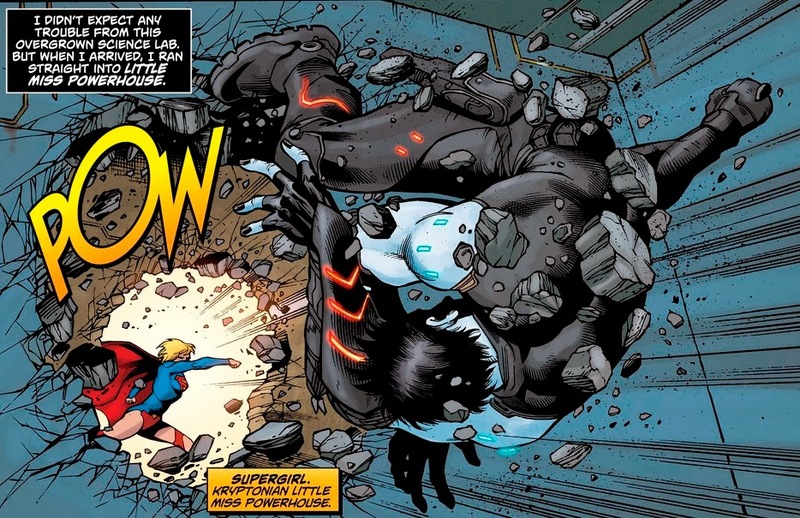 This is just a great panel, Supergirl smashing Lobo through not one but two walls. Great dynamic feel to it. I also like Lobo's internal monologue here as he calls Supergirl 'little miss powerhouse', a title echoed in her naming caption. I gushed about the use of Blaze as a villain for Supergirl last issue. I think it is inspired. I do hope that we don't see them throw down until after Supergirl has rid herself of the ring. I included this panel for a couple of reasons. One, this looks like a statue of Blaze which makes me think that her containment unit isn't necessarily a cage but a portion of her kingdom stuck in the Block. I mean why would this statue be put in a simple containment cell? Regal, sitting on the backs of her minions, weird glyphs on the pedestal. It shows just how insane Veritas is, hoping to contain a demon's world! Again, beautiful work by Cinar. 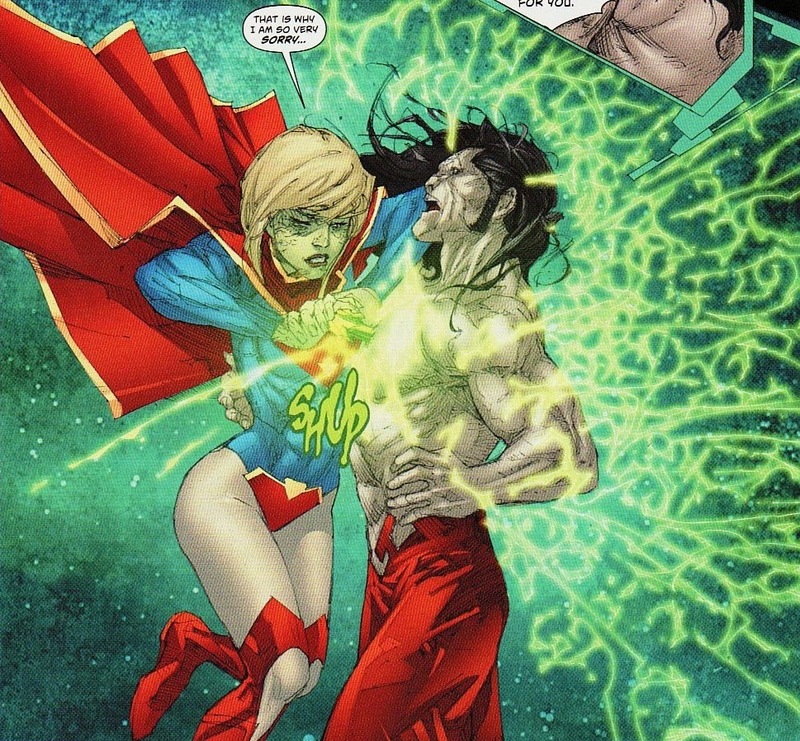 Lobo does a good job of egging Supergirl on. His hope is to destroy The Block enough to force Veritas to teleport him outside. And to increase the destruction, he needs to inflame Supergirl. So he insults her throughout the initial portions of their fight. So we see Supergirl's resolve slowly erode from the banter. Two issues ago she was upset thinking that she killed Lobo. Here, she feels that it is weakness to show that restraint. And eyes blazing, she vows to show she isn't weak. It saddens me a little that Supergirl has become reduced to this angry, smoldering, ball of hate. This simply isn't her. 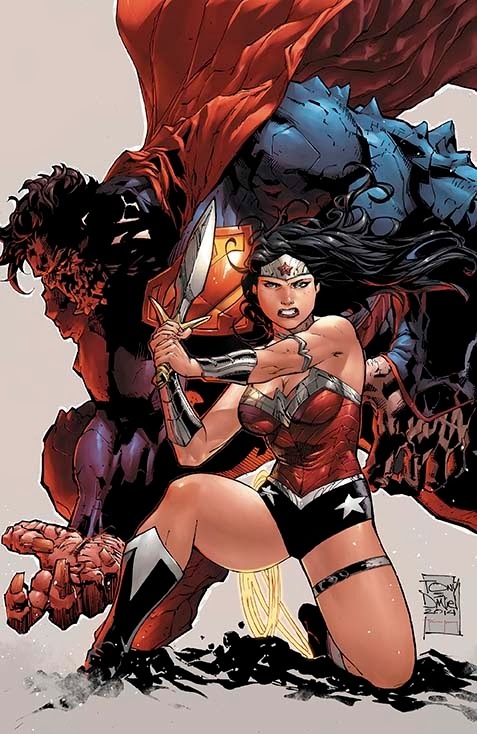 I can hear blog friend John Feer already - she is the Hulk of the DCU right now. Once outside, Lobo actually changes his tune. Now, he almost wants to help Supergirl. He sees in her a kindred spirit. They both are alone, both a survivor of a doomed world, and both incredibly powerful. He tells her he felt the same way she did but channeled his rage into his work. Maybe she should do the same. Like Reign was in the earliest issues here, Lobo is a dark reflection of what Supergirl could become. And that dynamic might have been interesting to explore ... if we didn't already know that she is doing something just as bad in accepting the Red Lantern ring. Bedard does layer on one more slab of betrayal onto Kara. The last couple of issues have made it seem like Supergirl was going to live in The Block, or call it headquarters. Veritas had reached out to her. Now we learn that Veritas doesn't think to highly of Kara. One other person she has let get close to her who has let her down. Hoping to calm Supergirl down a little to continue his pitch of them becoming partners, Lobo takes the fight to Siobhan's neighborhood, the last 'home' Kara had. But she is beyond caring and takes the fight to him. As far as I can tell, Superman has left her alone and hasn't tried to do much of anything. His is a sin of omission, removing Supergirl from his life. He has been the opposite of the overbearing cousin of the Silver Age. He has been an absent relative. That is the flaw ... heck that might be the flaw of this whole concept. And now she says Kal 'let her down'? How? She pushed him away and he listened? And without knowing about the Cyborg Superman, how did Zor-El let her down? By not letting her know his plans? I suppose I can chalk all this up to disorganized thinking, to anger feeding on itself until reason is lost. But it is telling that the last line here is that they all 'broke her heart'. Nice foreshadow to the red ring and its effects. And then finally we get this primal scream moment. 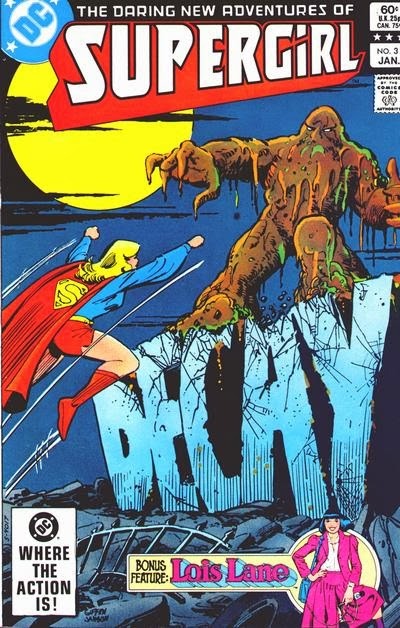 Standing over the pummeled Lobo, Supergirl screams she doesn't belong anywhere. She lost Krypton. She won't accept Earth. She fled the Block. She has nowhere else to go. Frankly I am sick to death of this sort of Supergirl. I want her to be young and optimistic and full of righteous fury trying to help bring justice to the world. I want her to make mistakes, grow, and get better. I don't want this monster. But again, if this is the way to bring us back to a likable Supergirl I will go with it. It's like taking bad tasting medicine. I will say that the moment that raised this up a bit was this one. 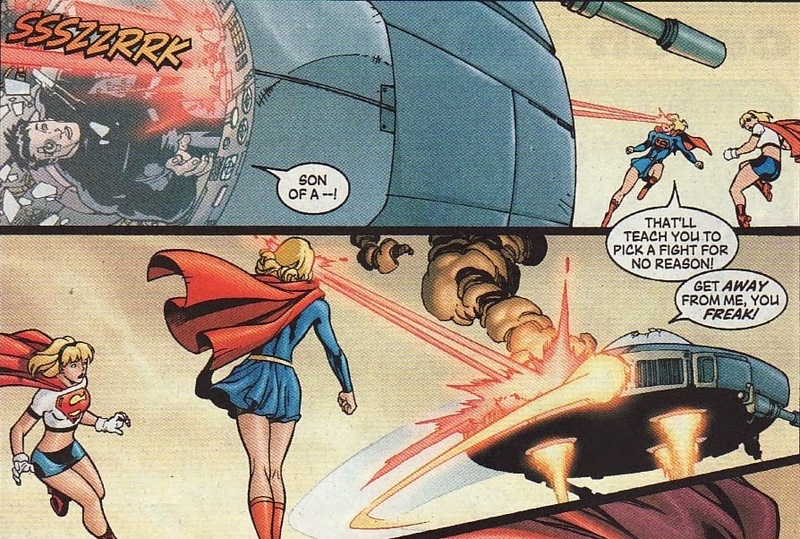 The book ends with a shot of Supergirl in her Red Lantern regalia and breathing fire. But this was the best moment in the book. Who hasn't, in a moment of despair, looked to something wrong and thought it was salvation? Whether it is real or merely perceived, Kara feels completely alone on Earth, completely abandoned. She has just lamented not belonging to something or to some place. And now here is a magic ring offering her a sense of belonging. Those words make this work. If this was 'you have great rage ... join us' it would not have the same effect. 'You belong ...' is a better hook for what Supergirl is dealing with. And the art captures that. Yes it is an angry face. But she looks hypnotized by the ring too. The red of the ring has completely washed out the yellow of the family crest ... a subtle way of telling me that she has forgotten who she is right here. And the color spectrum on her face is subtle but powerful, slowly bleeding into a deep red. The heck with the last splash of her as a lantern, something we saw 2 weeks ago. I wish this was the ending page. So how do I grade this? It is the beginning of a story that makes little sense to me as a long time Supergirl fan, grown from 2 years of stories trying to force the character into a mold she doesn't fit. But it might be the fire needed to burn all that stuff away and get the character back on line. There are subtle moments (like the one above) which work showing Supergirl's despair. But there are moments where she seems irrational, blaming others for the problems she has brought on herself by running away all the time. The art is superlative. But I reserve the right to change my mind if this red lantern stuff plods or moves the book backwards as opposed to moving it ahead and back on track.